President Donald Trump wants the United States to be at the „top of the pack“ with nuclear weapons. But his goal has already hit a snag: The infrastructure that supports the country’s nuclear weapons is crumbling to „alarming“ levels, a Congressional panel warned on Thursday. Much of the infrastructure that supports the US nuclear weapons programs, including labs, production facilities and weapons storage complexes were built six decades ago. The ageing buildings require constant upgrades and renovations to ensure the safety of the government employees handling the weapons – and secure the weapons themselves. But it’s not happening. There’s a $3.7 billion backlog in deferred essential repairs to the US nuclear weapons infrastructure, overseen by the National Nuclear Security Administration (NNSA), a semi-autonomous arm of the Department of Energy. The maintenance problems are „quite alarming“ and „pose the risk of a dangerous nuclear accident“, said Democrat Congressman Tom O’Halleran during a House Armed Services subcommittee hearing on infrastructure needs of the nuclear security enterprise. The warnings come as the US government begins to pour more than $1 trillion into modernising its nuclear weapons stockpile over the next 30 years. It’s a top priority for Energy Secretary Rick Perry – who once ran a presidential campaign that called for abolishing the Department of Energy entirely – but the sorry state of NNSA facilities may bog down modernisation efforts from the start. As they maintain or research nuclear weapons, NNSA employees are subject to leaky roofs, faulty ventilation and even „routine encounters“ with snakes and rodents, according to Michelle Reichart, a top managing contractor for nuclear weapons sites. The NNSA has sounded the alarm bell on its ageing infrastructure before, and in previous years Congress set aside funds to curb the ballooning deferred-maintenance issues. But it wasn’t until last year that the NNSA halted the growth of the problem. Congressional members on the panel appeared willing to earmark further funds, but the NNSA ran into a roadblock of its own making. Congressman Mike Rogers asked Perry and the NNSA in January for a list of specific infrastructure projects that in the „intermediate-range“ could use stopgap funding. As of Thursday’s panel, the NNSA still hadn’t provided the list to Congress. „That is disappointing,“ Rogers told Klotz at the hearing. The NNSA didn’t immediately respond to Foreign Policy’s request for comment. Beyond the crumbling infrastructure, security experts worry the weapons themselves could be at risk. History’s proved them right in the past. In 2012, three anti-nuclear activists including an octogenarian nun broke into one of the country’s most secure nuclear weapons facilities, the Y-12 National Security Complex in Oak Ridge, Tennessee. In an embarrassing lapse in security, they spent two hours in the facility painting protest signs on buildings that processed weapons-grade uranium inside. The incident sparked immediate rebuke from Congress and the Department of Energy pledged to take action. Meanwhile, that trillion-dollar nuclear-weapons modernisation program will require thousands of warheads to be shipped across the country. But the office in charge of shipping those weapons is mired with problems that put the security of those weapons at risk, as a new Los Angeles Times investigation revealed. The energy department’s Office of Secure Transportation grappled with „widespread alcohol problems“ from its workers, who are responsible for driving nuclear bombs in ageing semi-trucks across the country. The Russian leader laid down the ultimatum as he promised Russian military build-up will continue in the face of US missiles deployments in Alaska and Europe. Putin warned the US missiles defence systems are „one of the most serious problems in modern times“. His comments come after Russian military chiefs warned of the rising threat of „nuclear war“ in Europe. Putin said: „While what we are doing is of local nature, what the US is doing in Alaska is of global nature. A missile defense system is being developed there. Putin stressed Russia doesn’t intend to be at war or compete with the US – but would respond to threats from the Pentagon. But he called for „cooperation“ between the powers – as US President Donald Trump is thought to want to warm up relations with Russia. Putin said: „Russia and the US are nuclear powers. We have a special responsibility to the planet, to the international community for the international security. Doomsday Clock scientists previously warned US missile developments could trigger nuclear war with Russia. New York City could start shaking any minute now. Won-Young Kim, who runs the seismographic network for the Northeast at Columbia University’s Lamont-Doherty Earth Observatory, said the city is well overdue for a big earthquake. The last big quake to hit New York City was a 5.3-magnitude tremor in 1884 that happened at sea in between Brooklyn and Sandy Hook. While no one was killed, buildings were damaged. Kim said the city is likely to experience a big earthquake every 100 years or so. New York has never experienced a magnitude 6 or 7 earthquake, which are the most dangerous. But magnitude 5 quakes could topple brick buildings and chimneys. Seismologist John Armbruster said a magnitude 5 quake that happened now would be more devastating than the one that happened in 1884. Russia has warned the US deployment of an anti-missile system will spark a new arms race and was a threat to world security designed to contain Russia and China. The US has deployed its THAAD (Terminal High Altitude Area Defense) missile system in South Korea in response to North Korea’s increasingly provocative ballistic missile tests. It is designed to shoot down short, medium and intermediate range ballistic missiles. The reclusive state has conducted five nuclear tests and a series of missile launches in defiance of UN resolutions. Viktor Poznikhir told a disarmament conference in Genev: ‚The presence of the global ABM [anti-ballistic missile] system lowers the threshold for the use of nuclear weapons, because it gives the US the illusion of impunity for using strategic offensive weapons from under the protection of the ABM „umbrella“. The Russian defence ministry also said it regarded US naval patrols in the Black Sea as a potential threat to its safety, because it was unclear what kind of missiles the ships were carrying. Russia, which illegally annexed Ukraine’s Crimea in 2014, has its own Black Sea Fleet based at Sevastopol. Earlier this month, North Korea fired ballistic missiles that landed in the sea less than 200 miles off the northwestern coast of Japan. The incident was one of the numerous military tests conducted by the despotic state, which has expanded its ballistic and nuclear missile capability in the wake of what it views as US and South Korean aggression. Pyongyang insists that it needs nuclear weapons for self-defence against ‚hostile enemies‘. South Korean and U.S. troops began the large-scale joint drills on March 1 that the North calls an invasion rehearsal. Robinson said the Ramapo has on occasion registered a measurable quake but has not caused damage: “The Ramapo fault is associated with geological activities back 200 million years ago, but it’s still a little creaky now and again,” he said. “More recently, in the 1970s and early 1980s, earthquake risk along the Ramapo Fault received attention because of its proximity to Indian Point,” according to the New Jersey Geological Survey website. In 1884, according to the New Jersey Geological Survey website, the Rampao Fault was blamed for a 5.5 quake that toppled chimneys in New York City and New Jersey that was felt from Maine to Virginia. “Subsequent investigations have shown the 1884 Earthquake epicenter was actually located in Brooklyn, New York, at least 25 miles from the Ramapo Fault,” according to the New Jersey Geological Survey website. BAGHDAD, Iraq – On the edge of the almost exclusively Sunni city of Fallujah, at one of the many army checkpoints on the road from Baghdad, drivers cannot help noticing a larger-than-life-size portrait of Iraq’s Prime Minister Haider al-Abadi. Is this picture of a Shia who heads a Shia-majority coalition government meant to warn Sunnis that Iraq has changed and they must learn to live in a country which they have lost the right to rule? Appearances are deceptive. The Abadi portrait is an exception. Posters and public pictures of the prime minister are remarkably rare, in contrast to the practice when his predecessor Nouri al-Maliki held the job until three years ago, let alone when Saddam Hussein ran his family dictatorship. More than that, most Iraqis, including Sunnis, view Abadi as a more acceptable ruler than Maliki was. He is seen as balanced, modest and pragmatic – a fitting symbol of the normalisation Baghdad is gradually undergoing, 14 years after the overthrow of Saddam. A crucial chunk of Mosul is still in the hands of Islamic State militants. The third of the country which IS once held remains largely in ruins although people are gradually drifting home. The chronically low oil price is causing widespread economic problems. Corruption is rife. But at least in the capital city violence and bombs, despite a succession of deadly IS attacks at the start of this year, are less frequent dangers than they used to be and a reasonable life is possible again. There are fewer checkpoints than six years ago, when this journalist last visited, and drivers get less angry with the queuing, accepting it as necessary. People take their children to ice cream cafes in the evenings or stroll around the shops. Iraqis in the diaspora are taking their teenage children on vacations to the „homeland“ to see where their parents used to live. “The Abadi government doesn’t have strong teeth to bite people. The prime minister has two qualities: he’s against violence and he’s not hostile to any group,” said Abdul Latif al-Humayem, a respected Sunni sheikh who served in Saddam Hussein’s administration and now heads a large government-supported charity, the Iraqi Sunni Waqf (Endowment). “Abadi is Dawa to the bone,” a foreign diplomat told MEE, referring to the Islamic party that the prime minister and his predecessor and rival, Maliki, have spent most of their lives in. Even some Maliki loyalists acknowledge Abadi’s skill at keeping all sides in play, on foreign as well as domestic Iraqi issues. “He wants balance in regional affairs,” said Saad al-Muttalibi, who sits on the Baghdad city council as a member of Maliki’s State of Law coalition. The looming defeat of IS in Mosul has given a new weight to Abadi’s foreign policy options. What will the role of Iran and the United States be in Iraq’s post-IS future? How will the internal dynamics of Sunni and Shia rivalries play out? General James Mattis, the new US defence secretary and a longtime hawk on Iran, visited Baghdad in February. He was soon followed by Saudi Arabia’s foreign minister Adel al-Jubeir, making the first trip by a senior Saudi official since 1990. According to Iraqi analysts, the aim was to try to pull Iraq into an anti-Iranian posture now that Tehran’s help against IS is no longer needed. The pressure on Abadi will continue at this week’s Arab League summit in Amman. “Certain countries want a Sunni bloc to confront Iran. The Gulf states, Jordan and Turkey are very concerned about Iran,” said Dhiaa al-Asadi, who heads the faction in Parliament which is loyal to Muqtada al-Sadr, the nationalist Shia cleric. He pointed to the way Iraq’s Sunni neighbours were intervening in internal Iraqi politics. Turkey invited several senior Iraqi Sunni leaders to Ankara earlier this month for a conference which seemed designed to create a new Sunni political alliance and perhaps lead to demands for federal autonomy for western Iraq where most Sunnis live. Along with Turkey, the Saudi, Qatari, UAE and Jordanian governments are believed to have financed the conference and those who attended. They included Vice-President Osama al-Nujaifi, former deputy prime minister Saleh al-Mutlaq, former finance minister Rafi al-Issawi and a controversial multi-millionaire businessman, Khamis al-Khanjar, who openly advocates making Iraq a federation with separate Sunni, Shia and Kurdish entities. There is a general consensus among Iraq’s political class that IS was able initially to win support in Sunni areas because many people in western Iraq felt marginalised. But looking to a federation as a solution is considered too radical by many Sunnis who vigorously opposed the Ankara forum. Some disliked the involvement of foreign powers, seeing it as a potential repetition of the proxy wars which have helped to tear Syria apart. Mahmoud Mashhadani, who served as speaker of parliament from 2006 to 2008, saw the Ankara meeting as a device to undermine a document called “the unified vision of the Sunni Arabs on the historic settlement initiative” which was drawn up under his leadership in a group called the Front for National Decisions. It proposes changes in the constitution to authorise more devolution of power to governorates without going as far as splitting Iraq into regions. The document is being given to the United Nations office in Iraq which has invited all interested politicians to give their views on Iraq post-IS, including election law reform, human rights and economic development. “If Iraq is to become a state with three components it will increase the power struggle”, Mashhadani told MEE. He blamed the Americans for creating sectarian quotas after they invaded in 2003. “The Ankara conference was wrong in the timing, the place, and the people who were invited. They’re under foreign control. We reject it. It gives the Shia an excuse to turn to Iran, and the Kurds to turn to Israel and other countries. It undermines the national reconciliation which we want,” added Mashhadani. The Ankara forum invited Salim al-Jabouri, the current speaker of Parliament, to chair the project as it moves forward. “I accepted on certain conditions which have been agreed. The aim must not be to divide Iraq, so ‘internal’ Sunnis must be brought in as well as those who live abroad. The movement must also co-operate with the Abadi government,” he told MEE. In spite of these changes, the project still disturbs some Sunni politicians because of the heavy foreign influence. Several of the project’s leaders have been invited to Amman to meet foreign ministers after the Arab League summit. The issue of Iran’s influence in Iraq is the key issue but it is widely exaggerated, according to Saad al-Muttalibi, the Maliki supporter. He claimed that those who voted for Maliki in the last elections felt betrayed because Iran switched its support to Abadi. No one denies that the cultural and economic links with Iran are close in contrast to those between Iraq and its other large neighbour, Saudi Arabia. Iraq has six border crossings with Iran but none with Saudi Arabia that is open to trade. Almost no Saudi companies invest in Iraq whereas Iran and Iraq invest in each other’s countries and Basra gets its electricity from Iran. “The Iranians are playing a long game and a waiting game,” said Sajad Jiyad, the director of the Al Bayan Centre for Planning and Studies. „Their investment in defeating IS will pay off. They got their hands dirty in Iraq. They put their skins on the line. They lost three or four generals plus a dozen senior officers,” Jiyad said. The Iranians saw the seriousness of the threat which IS posed. This explained why, in spite of their long-standing differences with the United States, the Iranians have not attacked US forces in Iraq since the Americans returned in 2014. This contrasted with Iranian policy of a decade ago when Iran sent weapons to militias who were fighting US forces, he noted. Yasser Abdul Hussein, the director of another think tank, the Al-Beladi Centre for Strategic Studies and Research, said people were grateful to Iran because it “helped immediately after Mosul collapsed in June 2014 while the Americans waited for three months”. US airpower may be decisive in the final stages of the battle against IS but Iran’s early contribution is not forgotten. No analyst in Baghdad expects Abadi to turn against Iran or join an anti-Iranian alliance of Sunni politicians and Sunni states, however much pressure the Trump administration or the Saudis decide to apply. Balance remains the name of the prime minister’s game. Another North Korean nuclear test is imminent, with preparations likely to wrap up this week, intelligence authorities in Seoul said Wednesday. There were expectations that the North could conduct a nuclear test ahead of the upcoming meeting between Chinese President Xi Jinping and U.S. President Donald Trump expected to be held on April 6 and 7 at the Mar-a-Lago resort in Palm Beach, Florida. “We are analyzing that there is a high possibility that North Korea will conduct a nuclear test ahead of U.S. President Trump and Chinese President Xi’s summit in the United States,” another intelligence official said. Pyongyang launched an intermediate-range missile on Feb. 11 to coincide with Trump’s meeting with Japanese Prime Minister Shinzo Abe at Mar-a-Lago after their summit at the White House the previous day. It was the North’s first such missile test since the onset of the Trump administration. Some military officials here speculate that Pyongyang may follow the Pakistan model and conduct multiple tests in the near future, including both plutonium and uranium devices. Pakistan conducted its first five simultaneous underground nuclear tests on May 28, 1998, jointly called Chagai-I, and a second nuclear test two days later on May 30 called Chagai-II. Other possible dates for a provocation by the North that have been raised by analysts include the lead-up to the late North Korean founder Kim Il Sung’s 105th birthday anniversary on April 15. Pyongyang will hold a meeting of the Supreme People’s Assembly, its rubber-stamp legislature, on April 11. The North Korea monitoring website 38 North, run by the U.S.-Korea Institute at Johns Hopkins University’s School of Advanced International Studies, said Tuesday that its latest satellite imagery of the Punggye-ri nuclear test site in Kilju County, North Hamgyong Province strongly indicates that nuclear test preparations are in the final stages. 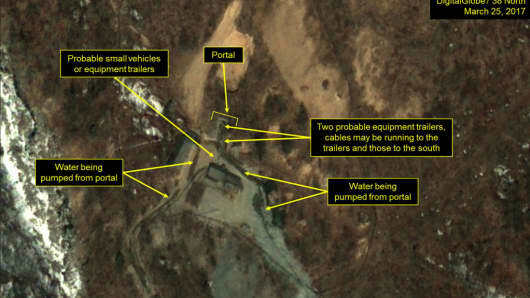 The satellite imagery from March 25 shows the continued presence of three to four vehicles or equipment trailers at the entrance to the North Portal at the Punggye-ri test site, it pointed out, while the texture of the ground at the portal entrance suggests that communications cables may have been laid down there. This equipment, according to its analysis, “would likely be used to initiate the test, collect data from the explosion and process the data,” while water is being pumped out of the portal and drained downhill, apparently to keep the tunnel dry for monitoring or communications equipment. “The combination of these factors strongly suggests that test preparations are well underway, including the installation of instrumentation,” it added. Satellite imagery of the Punggye-ri nuclear test site in North Korea on Mar. 25, 2017. Satellite imagery of North Korea’s main nuclear test site taken over the weekend indicates that Pyongyang could be in the final stages of preparations for a sixth nuclear test, a U.S. think tank reported on Tuesday. Washington-based 38 North, a website that monitors North Korea, said the images from Saturday showed the continued presence of vehicles and trailers at the Punggye-ri test site and signs that communications cables may have been laid to a test tunnel. Water was also being pumped out and was draining downhill „presumably to keep the tunnel dry for monitoring or communications equipment,“ it said. The think tank reported over the weekend that the vehicles and trailers at the site could have been used to install a nuclear device for an underground test. Another 38 North report said recent satellite images of North Korea’s nuclear research center at Yongbyon showed rail and vehicle movements that could indicate a plan to resume reprocessing of spent fuel rods to produce plutonium for bomb fuel. North Korea has conducted five nuclear tests and a series of missile launches, in defiance of United Nations sanctions, and is believed by experts and government officials to be working to develop nuclear-tipped missiles that could reach the United States. A South Korean military official said on Friday that North Korea had maintained readiness to conduct a new nuclear test at any time and U.S. officials also say they are concerned about additional missile and nuclear tests in the near future. North Korea said last year it had mastered the ability to mount a warhead on a ballistic missile and has been ratcheting up a threat that its rivals and the United Nations appear powerless to contain despite successive rounds of sanctions. U.S. officials told Reuters on Monday that North Korea had carried out another test of a rocket engine that could be part of its program to develop an intercontinental ballistic missile. At the 2017 Carnegie International Nuclear Policy Conference, a biennial gathering of nuclear experts in Washington DC, Vipin Narang, a US-based South Asian nuclear expert, created quite a stir with his remarks on a potential change in India’s nuclear approach towards Pakistan. He said that, contrary to conventional wisdom, India might launch a preemptive disarming strike in response to an “imminent” risk of a nuclear attack to curb Pakistan’s ability to launch a nuclear attack against India. Professor Narang made references to a series of recent opinions coming from Indian policy circles. These included a statement by former defence minister Manohar Parrikar questioning India’s No First Use (NFU) policy, an article by the former head of Strategic Forces Command, Lt Gen BS Nagal and a recently published book by former national security adviser Shivshankar Menon. Professor Narang said that this does not necessarily indicate a doctrinal shift or a change in India’s NFU posture. These views, in his assessment, demonstrate a change in strategy that shifts India’s counter-value strategy to a massive counterforce first strike against Pakistan’s nuclear arsenal. He highlighted what Menon calls a “grey area” in the Indian nuclear doctrine and quoted an excerpt from Menon’s book: “Circumstances are conceivable in which India might find it useful to strike first, for instance, against an NWS that had declared it would certainly use its weapons, and if India were certain that adversary’s launch was imminent”. Professor Narang opined that the “force requirements India needs in order to credibly threaten assured retaliation against China may allow it to pursue more aggressive strategies, such as escalation dominance or a ‘splendid first strike’ against Pakistan”. He termed it the “decoupling” of the Indian strategy between Pakistan and China. This is not the first time that India’s nuclear policy has come under a heated discussion. There is an enduring debate within India that addresses the various pros and cons of its nuclear policy since its latest announcement in 2003. Notwithstanding the pressing debates regarding the revision of the nuclear doctrine, there has been no official move to that effect by the Indian authorities. The BJP flagged the issue during 2014 election campaign and alluded to the revision of India’s nuclear doctrine – especially the NFU posture – in its election manifesto. This was done “to revise and update (the nuclear doctrine), to make it relevant to challenges of current times”. However, once the BJP came into power, the debate was put to rest by the Modi government. Recent statements by senior officials – who have previously worked on the nuclear policy – have not been retracted by government officials as yet. While this does not indicate an imminent change in India’s nuclear policy, it certainly merits close scrutiny because, if adopted in future, it will have serious consequences for regional stability. First of all, Menon’s assertion indicates that India will consider the threat of an “imminent” nuclear attack from Pakistan, sufficient to trigger a massive response. This assertion is problematic as it will not only lower the nuclear threshold significantly but may also increase the risk of an unintended nuclear crisis because of a “use it or lose it” dilemma. Furthermore, it will not just be a mere change in strategy, as emphasised by Professor Narang. On the other hand, it will mark a clear departure from India’s NFU policy and will not be covered under, what Shiv Shankar Menon calls, the “grey areas” or the “flexibility” of the existing Indian doctrine. No matter what euphemisms are used to justify this suggested nuclear first strike, India will lose the diplomatic edge it had enjoyed over Pakistan with its declaratory NFU policy. The NFU is a political declaration with no specific tools available to verify it. Pakistan has shown its scepticism over the credibility of India’s declaratory NFU pledge – particularly after the addition of certain caveats in the 2003 doctrine, such as the use of nuclear weapons in response to a chemical or biological attack on Indian forces. The new policy recommendations from authoritative sources, in a way, vindicate Pakistan’s concerns over the alleged Indian doublespeak – especially in the wake of Indian army chief’s recent statement that acknowledges the existence of the Cold Start doctrine after years of plain denial. From an operational point of view, carrying out a decapitating attack will require a higher level of accuracy along with real-time intelligence and larger arsenal – which India lacks at present. India will also have to factor in the evolving nature of deterrence in South Asia where Pakistan has demonstrated its preparations towards an assured second-strike capability with the launch of Babur III, a sea-launched nuclear-capable cruise missile (SLCM). Such signalling, however, hints at some potential future trends. India is on its way to advance its intelligence, surveillance and reconnaissance (ISR) capabilities. With the further development of remote-sensing capabilities and satellite information-sharing arrangements with the US as a result of the space cooperation agreement, India may claim a certain degree of confidence. But it will surely not be enough to completely disarm Pakistan in a comprehensive first strike. India might rely on missile defence capabilities to intercept residual attacks. But this again is limited to only a couple of cities and does not offer a foolproof security against incoming missiles. Notwithstanding the level of readiness, such pronouncements may affect the current recessed mode of deterrence and may lead to more aggressive postures and strategies. In this process, credible minimum deterrence is likely to be the first causality. India will require a large number of missiles with an increased readiness level to carry out such a threat. Pakistan might want to ensure the survivability of its arsenal to keep its deterrence intact. It might choose to develop a greater number of weapons than otherwise planned and further consolidate its second-strike capability. By all means, it will adversely impact fragile strategic balance because it replaces existing ambiguity with confusion. Given the already challenging security environment and the absence of escalation control mechanisms, such developments will only increase the risk of an unintended crisis. The writer is a research fellow at the Vienna Centre for Disarmament and Non-Proliferation (VCDNP) Vienna, Austria. Twitter: @noorsitara. Geologists recorded a small earthquake that occurred — but apparently escaped the notice of residents — on Saturday afternoon in Morris Plains. The tremor, registering a minor 1.3 on the Richter Scale, was reported by Columbia University’s Lamont-Doherty Observatory to the Morris Plains Police Department, which issued an advisory to residents on Monday morning. „To date (there) were no reported injuries or damage related to the earthquake and no Morris Plains residents reported any activity to this agency,“ Chief Jason A. Kohn wrote. Lamont-Doherty spokesperson Kevin Krajick said the quake was pinpointed to a shallow depth of 6 kilometers just north of Grannis Avenue, between mountain and Sun Valley ways, about 500 feet southeast of Mountain way School. Lamont-Doherty seismologist Mitch Gold said there was no particular fault line to identify under Morris Plains. „It’s not like California, where the fault lines are more defined,“ Gold said. Gold said the northern New Jersey region had been quiet of late, but several minor quakes were felt last year in Kinnelon, Butler, Riverdale and other points in northern Morris in the area of the Ramapo fault line. Butler police received several calls on Aug. 8 from residents who felt a small earthquake. „Yes, we got a bunch of calls about it, between 9:30 and 10:30,“ Butler Police Lt. Mike Moore said. The 1.0 magnitude quake, which was registered by the USGS at 10:01 p.m., was centered near the eastern shore of the Wanaque Reservoir in Wanaque, about six miles from the Morris County borders of Butler and Riverdale, according to the United States Geological Survey. Another quake — a 1.1 magnitude felt in Kinnelon and Butler — occurred at 4:06 a.m. on July 4, at a depth of two kilometers and occurring about one kilometer east southeast of Kinnelon, according to the USGS. Three more minor earthquakes jolted northern Morris County on Feb. 21, three days after a larger quake was felt in the same area. The epicenter of those earthquakes was about 1 mile northeast of Kinnelon. All were minor tremors, the first registering a magnitude of 0.6 at 10:07 a.m., and the second registering a 0.1 at 10:48 a.m. Both of those tremors were estimated to have originated at a depth of 1 mile. A third and final quake registered a 0.2, originating at a depth of 0.3 miles. The USGS says earthquakes with a magnitude between 1.0 and 3.0 aren’t typically felt. But Butler Police Chief Ciro Chimento previously confirmed his department received more than 1,000 calls about a 1.6-magnitude quake that occurred on the evening of Feb. 18. Another magnitude-2.07 earthquake also hit northern New Jersey on Jan. 2. 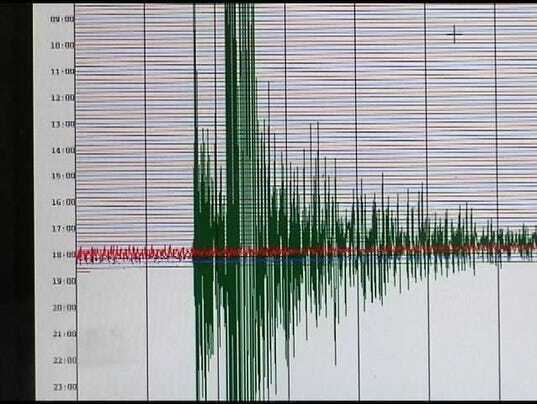 Mahwah residents as well as those in New York’s Rockland County also reported feeling that quake. Earthquakes are generally less frequent and less intense in the northeast compared to the U.S. Pacific Coast, according to the New Jersey Department of Environmental Protection. But due to geological differences between the regions, earthquakes of similar magnitude affect an area 10 times larger in the Northeast U.S. compared the West Coast. New Jersey’s largest recorded earthquake occurred in 1783. Felt from New Hampshire to Pennsylvania, that earthquake was estimated at a magnitude of 5.3. New Jersey has never recorded a fatality due to an earthquake, according to the DEP.